Hello friends! This weekend is a busy one. Tis the season for Christmas shows. Yes, we know it’s early but that way you can have half of your Christmas shopping done by Thanksgiving! If you are looking for something to do this weekend and you want to see a place that looks like Santa threw up all over it, then come on down to the the Colorado Country Christmas Show at the Denver Merchandise Mart. If that seems overwhelming, then come out to the the Applewood Arts Christmas show at Highlands Ranch High School, a smaller and more intimate show. 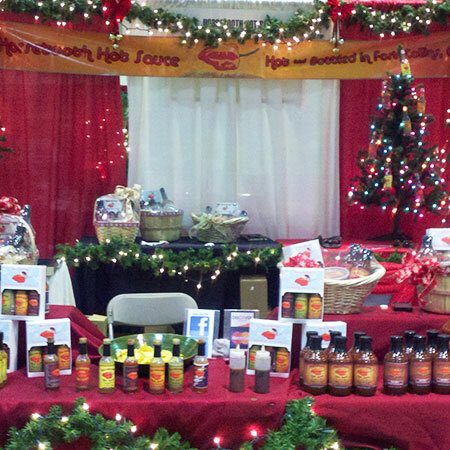 Horsetooth Hot Sauce will be at both holiday gift shows along with many other wonderful vendors from Colorado and beyond. We will be offering our wonderful three-pack holiday gift boxes with your choice of any of our six unique hot sauces. Give the gift of heat this holiday season. Give Horseooth Hot Sauce!